Really Mayor Bloomberg? How certain are you of that little assertion? Infinite debt would mean that the debt issued currency is worthless. Do you really want to open that can of worms? Do you really want to tell everyone who lives in this country, openly, that their wealth is nothing but debt notes – essentially IOUs? I know you are a fool, but stop speaking and confirming it for all the world to see. Here is the God-honest truth. For the United States, or any other government, business entity, or individual in existence to spend beyond their means, they must have someone, a government, business entity, or individual, willing to front their own capital as credit for them to do so. This is how deficit spending works. Bonds, certificates of deposit, corporate paper, stocks, funds, etc… they all exist fundamentally in order to enable credit-based spending by someone. Mayor Bloomberg, what happens when suddenly no one is available or willing to lend money for deficit spending? Will the Fed charge to the rescue? The Federal Reserve is already up to their eyeballs in bad debt with the so-called recovery and the paper shuffling and outright fraud that occurred in order to deceive the American public and the world that the debt intrinsic within the government-manipulated mortgage market had been properly cleared from the balance sheets, when in fact it had simply been shifted to the Reserve’s books and off of the lenders’. The problem is that spending can not increase in perpetuity. Without actual wealth generation, any currency creation beyond the available pool only serves to devalue the currency across the board. This is a basic economic law. Supply, demand, and valuation are intrinsically linked and the mathematical relationship between them CANNOT be tinkered with as it is outside of your, and anyone else’s, control. That economic law is as concrete as the laws of thermodynamics, the principle of conservation of mass, and the speed of light. And here’s where the essential problem is for progressives – they deny the absolute nature of this world. They may give lip service to the constant relationships that have been measured, but they do not believe them to be true, or worse, they believe that they themselves have the power, wisdom, and ability to rewrite these constants as they see fit. This is megalomania writ large. This is equating yourself with God. In the course of human history, these men have all met the same end. I had a brief conversation with someone a few days ago about the unemployment report that came out on October 5, 2012. Recall that the night before, President Obama took a drubbing at the first of the Presidential debates of the fall. The numbers at face value seem to be great until you actually look at the statistics themselves. This person did not want to acknowledge that the report itself was possibly inaccurate and simply touted it as good news economically. The media and the liberal politicians nationwide did much the same and immediately began to pound conservatives by basically saying “look it IS working,” but let’s consider a few interesting points (Some courtesy of Market-Ticker). Supposedly about 114,000 jobs were created in one month. The work force part of the population grew by 206,000 in one month. The basic math is that when the base grows by more than the number of jobs added, then unemployment actually went up. The Not-in-Labor-Force number, which are working age adults that are unemployed and not looking for a job any longer (basically, the people that are giving up completely) grew by 386,000 while the number of people that came off unemployment by gaining employment was about 775,000. That is 1,161,000 people that came off unemployment in one month. The Bureau of Labor’s most oft-reported number only counts what they deem the total unemployed (U-3) figure when it is seasonally adjusted. The problem with this thinking is that you are considered employed if you get a job that pays minimum wage and you only work for part-time. The more accurate number to gauge how the economy is doing is the U-6 figure, which is 14.7%. This figure in and of itself is still somewhat flawed as it only counts people that have looked for a job in the 12 month period. According to CNN, nearly one in three unemployed people nationwide have been out of work more than one year so they are not even factored into the unemployment rate calculated by the Bureau of Labor Statistics. According to the October 2012 BLS report, there are 243,772,000 people in the workforce population nationally. One year ago, there were 240,071,000 in the workforce population. That’s a net change of +3,701,000. The number of employed only grew by +2,832,000 however. So the number of jobs lagged the number of adults in the workforce by 869,000 jobs. So the unemployment numbers went down? If there are 869,000 more adults in the workforce than there are jobs today than one year ago AND people that have been unemployed more than one year are not counted in the unemployment figures compiled by the BLS, than how in the world can unemployment be down? Go back to my first point – when the population grows faster than the number of jobs for the same population, unemployment rates actually go up. I smell some intentionally bad math. So let’s extrapolate a little here. For the ease of math, let’s assume that the unemployment rate is actually 7.8% as that is a best case scenario. If one in three Americans that are unemployed have been unemployed for more than a year (which means that they are not factored into the unemployment rate reported by the BLS), then the actual unemployment rate is approximately 11.7%. Job growth is not on pace to keep up, let alone exceed workforce population growth (Breitbart). The statistics fail to chart the long term unemployed, so the numbers “sound” better, but the overall picture is still grim. You can bury your head in the sand and shout “7.8%!,” but if you fail to look at the whole picture, you will be mistaken. Wednesday, October 3rd, 2012 is the first Presidential debate of the 2012 campaign. This first debate is one regarding domestic policy. The announced topics will be the economy, health care, the role of government, and governing. Will they be worthwhile topics to explore each candidate’s philosophies or will they be so obscure as to leave both candidates enough wiggle room to answer however they choose based on the most recent opinion polling? Will we really get a significant debate or just more rehearsed lines? Will the moderator ask tough questions or toss softballs? So in honor of this, let’s take a look at ten questions that I would like to see asked at the debate. There are in no particular order. 1. Both of you claim to have the answer in terms of job creation within the economy. What is the role of government in terms of job creation? Where in the U S Constitution is that role specified? 2. Explain in detail how you will eliminate first the deficit and then pay down the national debt. What programs will need to be cut, what departments will be shut down, and what austerity measures do you think we need to take as a nation in order to avoid following down the path of Greece, Spain, and all of the other nearly-failing states? 3. What is your understanding of the role of government? What are the most crucial things that government does for the citizens? 4. Explain how you think deficit spending helps or hurts the economy? Is deficit spending necessary to “prime the pump” or is it a form of taxation that drains the energy from the economy at large? 5. How do you propose to fund the hundreds of trillions of dollars in unfunded liabilities that previous administrations have incurred by massively increasing social welfare programs? Can they be funded or do we need to seriously curtail these programs in order to save the Republic from bankruptcy? 6. What is the role of government in healthcare? Can you cite in the Constitution where that role is indicated? With the rapid growth of healthcare costs in the last few decades, explain how your administration would lower costs within Constitutional limits. 7. Explain your personal beliefs of where the rights codified in the Bill of Rights originate. Do you believe that they are absolute or not? What modifications would you personally like to make? 8. When you speak about job creation, each of you promises lofty job growth numbers that seem impossible given the current economic climate. Explain what the typical job your plan would help generate would be. Would it be a temporary job, such as road construction, or a permanent job such as inside a machine shop? 9. Tell me who is a good leader in your mind. Why? Which of their characteristics do you want to emulate when governing? Who is going to pay for the United States’ and to remainder of the world’s governments unrestrained splurge of government spending? Currently, as I write this, the U.S. national debt sits at $16,015,769,788,215.80. The 2011 US GDP was $15,094,000,000,000.00. This is not news. This was entirely foreseeable as the President, together with single party rule in Congress during 2008 through 2010, failed to address a single budgetary concern or make any attempt to control the budget and our burgeoning national debt. This election season has seen a lot of focus on the deficit which is just a single year’s shortfall in terms of expenditures against tax revenue. What needs to be talked about though is how the national debt is a greater concern. Just paying the interest on our national debt last year (2011) cost the United States $454,393,280,417.03. That is approximately 3.01% of our GDP, just to service the national debt’s interest payments, and a lot of our debt is issued in terms of bonds and t-notes that come due on a revolving basis for interest payments, so that is not the whole story. As of today, treasury yields (which is basically the future interest rate paid) are indexed at 1.59% for a 10-year term, 2.3% for a 20-year term, and 2.69% for a 30-year term. These rates are being kept artificially low however. The Federal Reserve Board has been purchasing these debt securities at lower yields to prevent the Department of Treasury from failing to secure buyers for the debt at manageable interest rates (WSJ). The long term outcome of this can not be positive as it is the left hand hiding what the right hand is doing and is basically just a large scale cost-shifting. 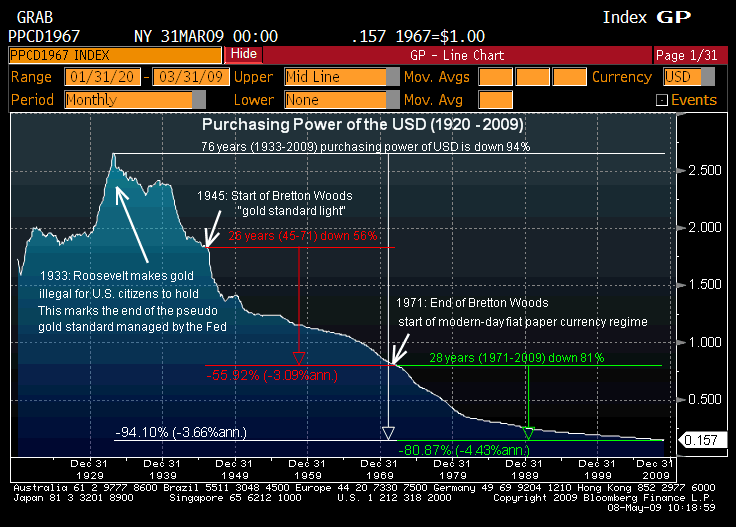 The loser will be you and I as our purchasing power, via the value of the dollar, will decline as this continues. Basic market economics dictate that if an investor thinks that buyer a security (a treasury bill, bond, etc) is not worth the risk, then the seller must raise it’s value by increasing it’s yield (interest paid upon the completion of the term). In short, if the Fed suddenly finds themselves unable to keep hiding the tremendous debt problem that the US finds itself in then we will see sales of treasuries at increasingly larger interest rates as investor confidence requires greater payouts in order to entice buyers. This will cause the costs of debt servicing to rise, and for a country already running deficits in excess of a trillion dollars, suddenly the US does not look able to pay it’s own debts in the long run. The only way out of this is for us to immediately stop spending more on government programs and services than we can immediately pay for with current tax revenues (balanced budget). The problem we must then face is how to pay down our debt so our own interest rates don’t kill us. Author’s Note: For a much better understanding and explanation of this situation, I highly recommended everyone read Karl Denninger’s Market Ticker and his book Leverage.